View More In Active - Page 4. Searching For Shirts Thatâ€Ll Keep Up With Your Busy Kids? Our Toddler Graphic T-Shirt Is A Solid Choice And A Great Value. Wear It Solo Or Layered: As Flexible As You Need It To Be. Made In Cotton Fabric, This Toddler Shirt Is Lightweight, And Soft Against The Skin. 2 Toddler: Bust: 12.59" Length: 15.74"
3 Toddler: Bust: 13.77" Length: 16.92"
4 Toddler: Bust: 14.37" Length: 18.5"
5-6 Toddler: Bust: 14.96" Length: 19.68"
Due To Manual Measurement, Please Allow Will Be 0.5-1.0inch/1-3cm Error. 100% Cotton, Lightweight, Soft Against The Skin.Size 1-6 Toddler. 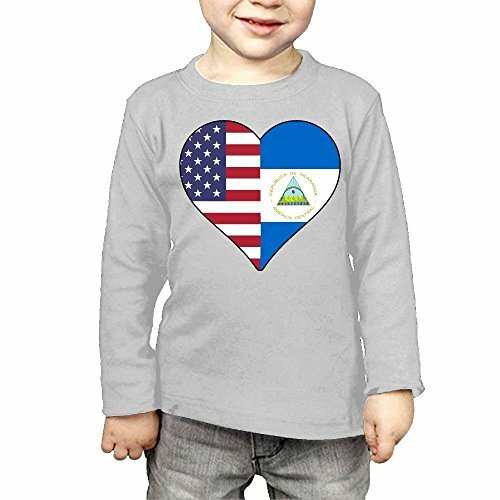 Kid Baby Girl Boy Clothes Long Sleeve Half Nicaragua Flag Half USA Flag Love Heart Print Top Shirt Blouse. Great For A Day Of Playing, Running, And Any Other Of Your Toddler's Favorite Activities. Hand Wash Reverse Side And Use Gentle Detergent, Do Not Scrub And Iron Printing Pattern. If you have any questions about this product by CERTONGCXTS, contact us by completing and submitting the form below. If you are looking for a specif part number, please include it with your message.